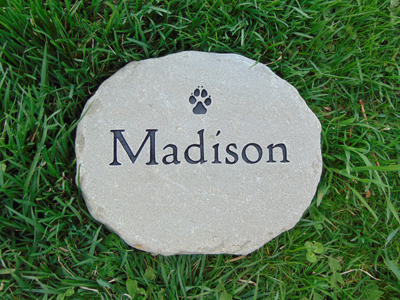 Our small engraved stone is 8-10 inches across and comes with one line of text as well as a graphic if you choose. We call it a small but it is as big as some of our competitors mediums and is much more affordable. 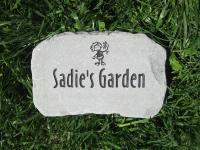 All of our stones are 1.5-2 inches thick and will lay flat on the ground or can be propped up. Would you like us to include a card? 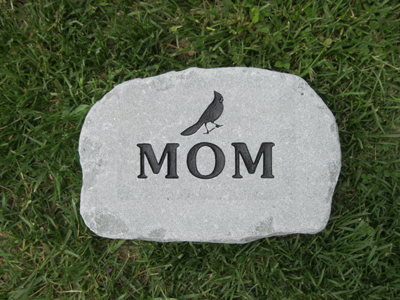 I want everyone to know that I found your site online as I was looking for a couple small memorial stones for my backyard. I had never heard of you before and just took my chances by ordering online. I placed my order on a Saturday and I received both custom engraved stones the next Friday. 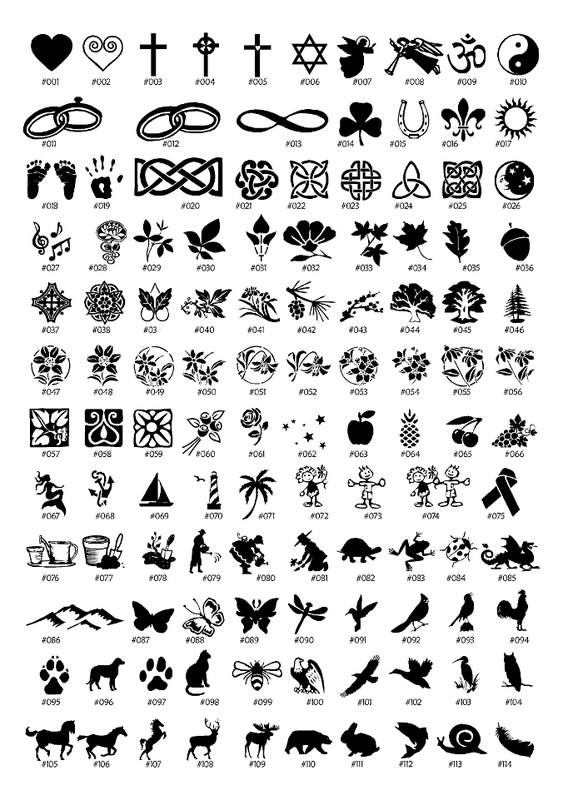 Your service and quality have exceeded my expectations I and HIGHLY recommend you. These stones were packaged so well for shipping as well and it is impossible to beat your FREE shipping. I CAN'T SAY ENOUGH ABOUT YOUR COMPANY!! THANK YOU! 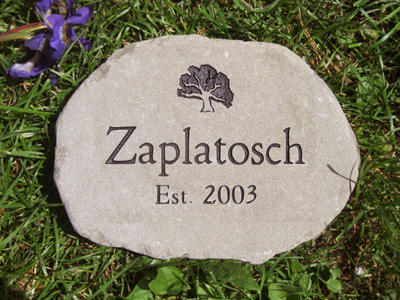 If anyone out there is looking for engraved stone.....look no further! 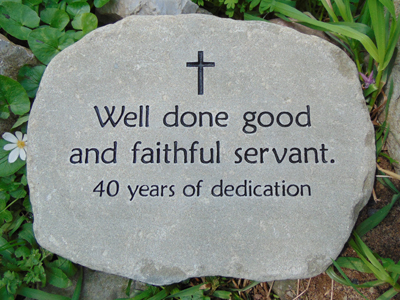 I just got the memorial stone for my brother. Thank you so much! I can't believe how quickly you got it here - 4 days from ordering to arrival. I never imagined it would be done and here in time for Memorial Day. It's just perfect - and so reasonably priced. I really appreciate it. I will definitely pass your name along to others. I just wanted to let you know I am very happy with the stones I ordered and they helped to make a fun family Christmas. There is a lot of joking about them. 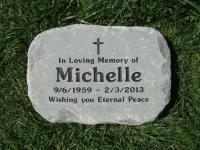 (one of my sons is making comment that his Mother gave him a tombstone for Christmas and he gets nothing next year til he uses this years) I just love all the stones and the service was great. Kids are saving cards for good gift ideas so hope it will bring in a little more business for you. Thanks, they are excellent!! 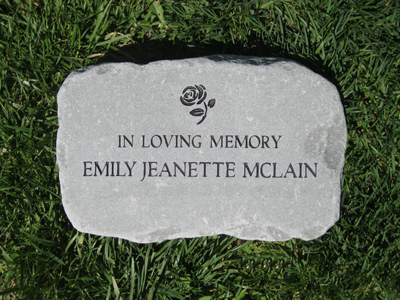 Just wanted to say thanks for the wonderful job you guys did on my parent's memorial stone. My Dad built this house over 60 years ago. Since I am the only one left, I wanted to put a visual marker out in our little front garden to commemorate my parents. The one you made is just perfect. Thanks so much and best wishes to you and your lovely family! 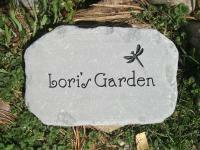 JUST RECIEVED MY STEPPING STONE FOR MY DAUGHTERS GARDEN.ABSOLUTLEY THE BEST ONE EVER! THANK YOU FOR THE QUALITY WORKMANSHIP AND THE SUPPER FAST TURN AROUND. 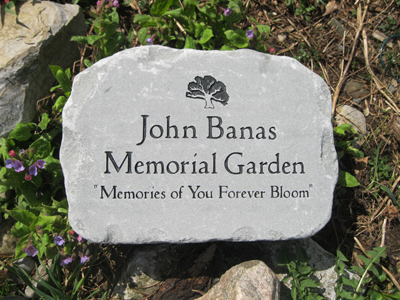 I received the garden stone yesterday - let me say that it was packaged beautifully, and the stone is really, REALLY great....THANK YOU SO MUCH for your work on this - the students here @ my school, and more importantly, the family of J., will be really thrilled with it once we put it down for all to see. THANK YOU! !